With Version 5.x it has completely revamped code with object oriented. 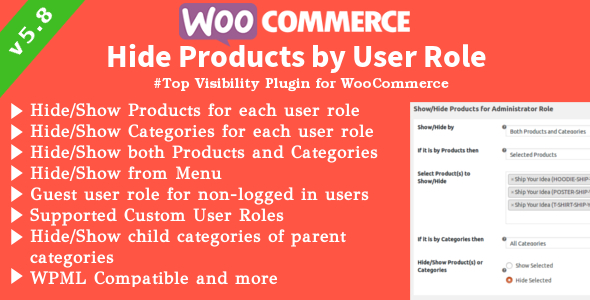 Whoever using WPML need not worry about selecting translated products in settings page instead select only parent products/categories and the rest will taken by our Plugin, which means translated products/categories associated with parent product will taken into account based on selection criteria. We focused all product types of WooCommerce. We designed demo page for different user role with different products and that demo is for each buyers means it is completely personal to anyone who request demo and have privilege to mess up around the settings. Personalized Demo can be created in a few seconds for you once solve math quiz.